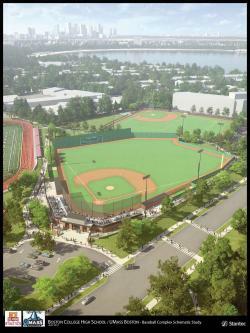 In a big boost for baseball players and fans of all ages in Dorchester and across the city, Boston College High School and the University of Massachusetts Boston – with a $2 million commitment boost from the Yawkey Foundation – have partnered up to build an extensive athletic complex that will be sited on high school property adjacent to the university campus on Columbia Point in Dorchester. The playing grounds will be shared by the high school, the university, and the community at large, according to the schools. For UMass Boston, the development will mean its Division 3 team will at last have a home facility for practices and games after years of traveling to Brockton to host visiting collegiate nines. The schools expect that Boston’s Park League will be talking advantage of the new facilities as will Babe Ruth teams from Dorchester and South Boston. The complex, which is expected to be finished by year’s end, will be named J. Donald Monan, SJ Park to honor the longtime president of Boston College for his outstanding educational leadership, vision, and commitment to the city of Boston, the schools said in a statement. A groundbreaking ceremony is scheduled for Thurs., June 11 at 4 p.m. on the high school grounds. Monan Park will offer numerous features that are commonly associated with athletic complexes along with some special touches that speak to Boston’s renowned baseball heritage. • A full-sized, 500-seat stadium for high school and collegiate level games. The main field will have the same dimensions of Fenway Park and include a left-field wall of familiar size and color, bullpens, warning tracks, full-sized dugouts, batting cages, a press box and full-service lighting. • A full synthetic turf facility, with clay pitcher’s mound; a secondary playing field for practice and sub-varsity games; and a full-sized soccer field within the secondary baseball field. • The park will also offer space for both baseball-specific and summer camp programs due to its proximity to both academic campuses. The schools say they expect that more than 1,000 youth and collegiate athletes will directly benefit from this complex on an annual basis. Simultaneously with construction of Monan Park, BC High will be renovating and upgrading the track facility within its football stadium. Through the generosity of alumnus Frank Keohane, Class of 1953, the track will be expanded to eight lanes and updated with a urethane-rubber track surface in memory of Frank’s brother, Cornelius Keohane from the Class of 1951. Work has already begun on the track rehab and is expected to be completed by late August.